Happy early Christmas! Here’s another free advent printable for you to work on over the long holiday weekend. All you need are twenty-four 3x3inch boxes (bigger is alright if you don’t mind a border), tape, scissors and the printouts! Fill with fun gifts and treats…you’re good to go! The project takes 30 minutes tops! This is lovely! It’s so fun to open a box filled with surprises! I loved the bag idea from yesterday, but now I like this one too! Great ideas, thanks for sharing! Oh, this is so beautiful, thank you! We don’t have any little ones yet, so I am going to print these, and use them on cards every day- to write a little sweet something to my husband each day before Christmas..
and of course, I will include some candy. Love this idea as well as your last one! Can’t wait to try this out! Love both this advent calendar and the bag advent calendar. Both designs are terrific. Hi Jordan, these are fabulous! I am printing them out and for some reason I am unable to print out the first page. It’s very possible this is my printer, or perhaps human error, but I have tried over and over and I was just wondering if you have any solutions? Thanks! so great, thank you ! Adorable! Maybe it is an idea to have a black/white version. You can print them on coloured paper. Then you can choose your own colours and only have to print in black. so pretty! where are you all putting/displaying the boxes? under the tree? I can’t download it Can anybody help me? These are so awesome! Thank you for sharing. Any suggestions on where to get the boxes? Ack these are GORGEOUS. Such a good idea! I may have to adapt this idea to tiny daily cards for my friends who are far away from me. I love this idea! Where is the best place to buy boxes this size in bulk? Jordan I miss your voice on the blog! Oh Happy Day feels more like a lovely magazine of late. Not that there’s anything wrong with that. But it’s like I want to say, ‘hey Jordan, while you’re in Paris you should start a blog!’ I miss the personal, everyday type of posts and pictures. I am making this as a little gift for the boyfriend. Except I am making the boxes too. Didnt realize how much work it is, Good thing I started early. 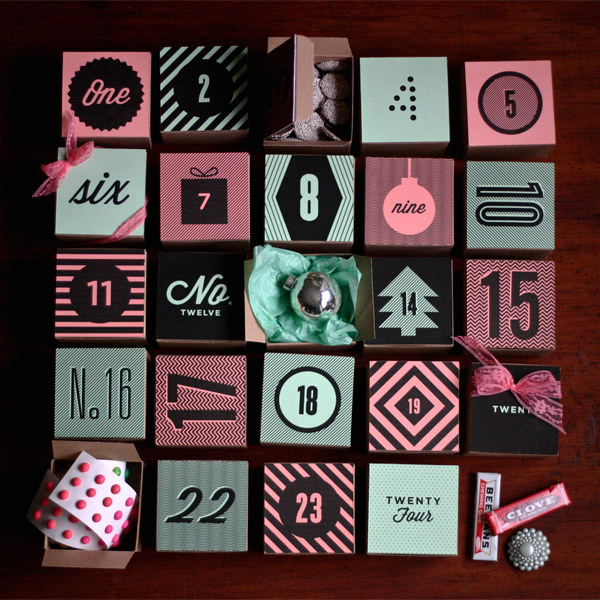 The coolest advent calendar I’ve ever seen!! This is beautiful. Lovely, Amanda! and was up for hours combing through it. I love your style! You are so creative and inspiring… so thank you. I’ve been looking for advent calendar ideas for weeks and weeks and just haven’t been able to find anything that was “me”…that is, until I saw this! I’m crazy about it! Thanks again. LOVE x3. Thanks so much! I adapted your template for smaller tins, and changed the colour scheme to better match our Christmas stuff. Thanks so much! Thank you for posting these printables! They came out great for my 2 year old daughter, and I can’t wait to see her open them.